A distinguished bipartisan committee of national political and community leaders selected Ford and Lewis for the prestigious awards for political courage. The John F. Kennedy Profile in Courage Award is presented annually to an elected official who has withstood strong opposition from constituents, powerful interest groups or adversaries to follow what she or he believes is the right course of action. The award is named for President Kennedy's 1957 Pulitzer Prize-winning book, Profiles in Courage, which recounts the stories of eight U.S. Senators who risked their careers to fight for what they believed in. 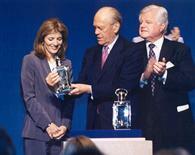 "For more than a quarter century, Gerald Ford proved to the people of Michigan, the Congress, and our nation that politics can be a noble profession," said Caroline Kennedy in presenting the Profile in Courage Award to the former president. "As President, he made a controversial decision of conscience to pardon former president Nixon and end the national trauma of Watergate. In doing so, he placed his love of country ahead of his own political future." The friendship that grew between Ford and President Carter, the man who beat Ford, became an important one. Not only did it show the power of reconciliation as a virtue in public life but the two were able to speak out on important issues with a bi-partisan voice. For example, the two spoke out against the impeachment of President Clinton. The American people were fortunate to have President Ford for his brief tour of duty in the White House. Let us pray for his family during this time of loss.